Osteopathy – Exclusively at our Town of Mount-Royal location. Are you facing business challenges in your salon or Spa? Or are you thinking about opening your own salon or Spa? We have over 25 years of experience and a proven successful track record in the Salon and Spa industry. Our approach is real-world experience and we have the expertise and the resources to guide you. • Franchise opportunities are also available. 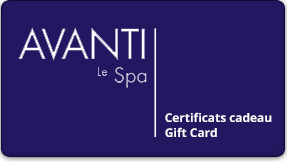 Call Avanti Le Spa at (514) 739-2575 or by email.